A & A Book Trust celebrates books and their unique power to make a difference. We have children, happy childhood and their need to grow at the heart of the whole effort. To help establish reading corners, libraries, activity centres in different villages, especially in small towns and villages not having any library or book store in the vicinity. These villages have a low literacy rate and no disposable income ‘to buy books’. 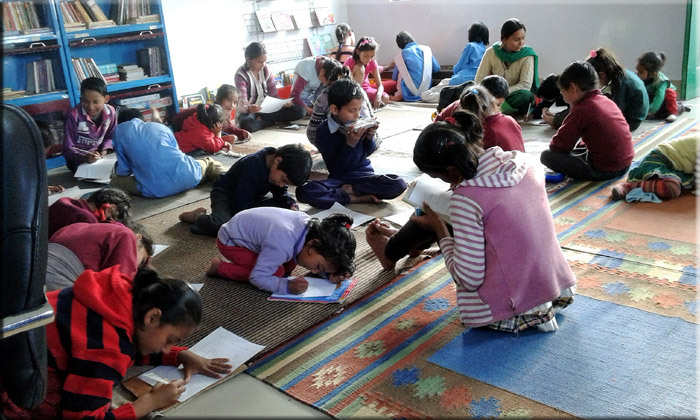 To help NGOs set up reading corners, libraries, activity centres in their respective regions, especially in small towns to link the children’s world to books and circulation of learning material to nurture their curiosity and awareness of the diverse world cultures. To select and publish books from different countries for our children and make these available to them in their own regional languages through translations and adaptations, on not-for-profit scale. Our books are pegged at the lowest price points to make these widely accessible to many. To offer scholarships, stipends, and donations for deserving needy students and institutions working for similar goals. To prepare and execute projects on international level to explore possibilities of co-operation and collaboration with institutes working for similar objectives in different parts of the world. To hold workshops, seminars and training sessions, and participate in similar events organised by other institutions and organisations, in India and abroad, and the different state governments of India, working for Literacy and Reading. To develop and facilitate visits for authors, translators, illustrators working on books wanting to make a contribution to children in our villages.